All i100 products includes 44 screw terminals. The i100B version provides 16 additional BNC connectors for analog inputs; and the i100HC version provides no BNC's yet does provide voltage output channels with 15mA of drive capability. 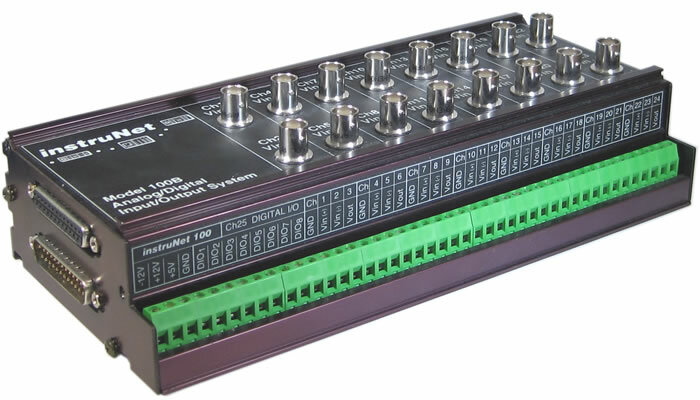 100B Same as #iNet-100, yet with 16 additional BNC connectors for 16se voltage inputs. 100HC Same as #iNet-100, yet with voltage outputs that have 15mA/.01uF drive capability.